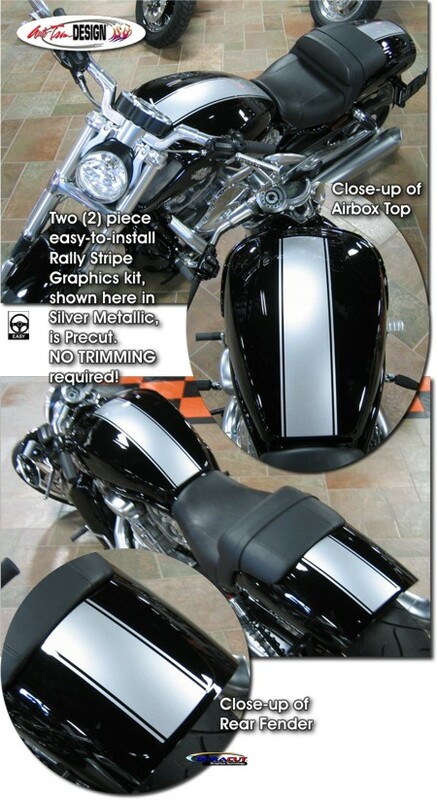 Set your Harley-Davidson V-Rod Muscle apart from the rest with this tough looking Rally Stripe Graphics kit. While a stripe is not shown on the Front Fender, we've included a length of product that can easily be used at no extra charge. Stripe package is not just a set of 4.5" (11.43cm) strips in a box. Kit consists of prefitted, tapered and contoured pieces that feature a .1875" (4.76mm) pinstripe at each side as shown. Kit is bike specific and will only fit the '09-Current Harley-Davidson V-Rod Muscle.